In a way, I feel like the victim of a bait-and-switch scheme. The movie I saw isn’t the one advertised in the trailers. 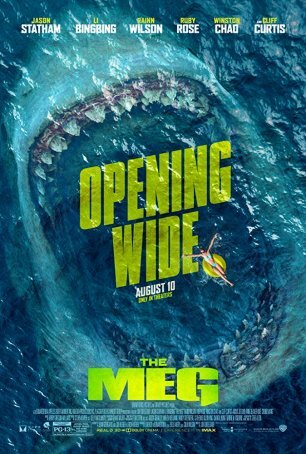 As marketed, The Meg looks like a breezy, campy monster movie that supersizes Jaws with an infusion of Jurassic Park. In reality, however, The Meg takes itself far too seriously. The only amusing elements are Jason Statham’s occasional one-liners coupled with his exasperated expressions. The thing that disappointed me the most about The Meg is its flat tone. There’s too little tension and not nearly enough suspense. The build-up to The Meg’s “reveal” is lackluster and the actual moment happens with almost no fanfare. (The scene in the trailer where the shark stares down the little girl would have made a great “reveal” but that moment occurs later in the film.) I gnashed my teeth with frustration at every misstep. By the end of the movie, I had probably worn away most of the enamel. It never seems fair to compare a shark movie to Jaws, so I usually opt for something less intimidating. A good runner-up might be the underrated The Deep Blue Sea, but The Meg isn’t in that league, either. Nor, in fact, does it even make it to the level of the 2016 Blake Lively effort, The Shallows. No, in order to find something on par with The Meg, one has to start looking at the Jaws sequels. Maybe not #3 or #4, but certainly #2, and that’s pretty bad. Like Skyscraper, The Meg was made more for a worldwide audience than a domestic one. Remembering that action (not comedy or drama) is the international language of film, The Meg is careful to lean heavily on the staples of spectacle – bangs, flashes, and special effects – and shy away from dialogue (the film is in English but will be dubbed in many countries). Hollywood understands what sells overseas and has made a conscious decision with productions like this to hedge their bets stateside and go for the box office jugular elsewhere. It’s the Pacific Rim model. Statham plays Jonas Taylor, a former U.S. Navy officer and deep sea rescue expert who is lured out of retirement when his ex-wife (Jessica McNamee) disappears 12 miles down in a trench off the Chinese coast after something attacks her submersible. Jonas is pretty sure he knows what that something is and, mid-way through the rescue operation, his theory is proven right: it’s a megalodon, a 75-foot long prehistoric shark that has found a way to survive in the dark, cold depths. After saving his ex and another crew member, Jonas returns to the underwater facility “Mana One” and meets the rest of the research team: his old buddy, Mac (Cliff Curtis); a beautiful Chinese scientist, Suyin (Li Bingbing), and her father, Dr. Zhang (Winston Chao); the antagonistic medical officer, Dr. Heller (Robert Taylor); and the guy controlling the purse strings, billionaire Jack Morris (Rainn Wilson). As they’re discussing how to let the world know about their amazing discovery, they learn that the “Meg” (as they’re calling it) hasn’t stayed where they found it. It has followed them up and now poses a danger to the sea base and Shanghai. Had the movie evinced a little more whimsy and a better sense of humor, it could have been a fun romp not unlike Jumanji. Statham can play tongue-in-cheek with the best of them but that’s not what he’s asked to do here. By failing to embrace the absurdity of the situation, the movie sets itself up as just another summer blockbuster-of-the-week without anything to distinguish or recommend it. The premise, like the trailer, makes The Meg sound more appealing than it is.